The Life of Kenneth: Joule Thief What? I'm retracting that last post. It was completely and totally wrong. In every way. Forget it. I fail. Doing some more electronics research today, and I happened upon this comment on Hack A Day. His response to mindtrap mentions that the Joule Thief prefers a power source with low impedance. Impedance is kind of like the alternating version of resistance. A circuit with a high impedance will strongly resist changing current, where something with a lower impedance will readily respond to a sine wave input. In the Joule Thief, the lower the impedance on the entire circuit, the faster it switches on and off, the more effective it is at draining those dead batteries. So how to lower the impedance of the power supply. 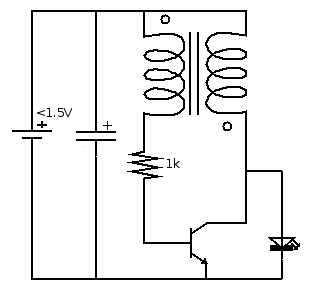 Originally this circuit is fed by a dead battery, which has limits on how much current you can pull from it. The chemical reactions taking place can only go so fast, so the solution is to connect the battery to something that can store and release energy faster. This would be the perfect place to use a capacitor. A capacitor works by having two plates of metal very close to each other without touching, so when you apply a voltage to the plates, they generate a magnetic field. Once the voltage source is taken away, the magnetic field is held, and can drain very quickly. One application is in the flash on a camera. When you take a picture (more with a disposable camera), you can hear it charge for a few seconds, but it can discharge VERY quickly. What's Up with Battery Prices? Tip of the Day - Where's the Door?